Congratulations (designer choice) arrangement. 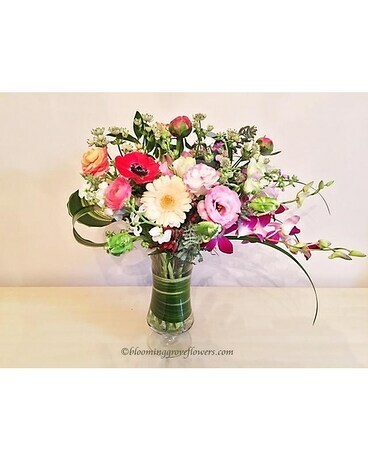 Featured flowers: peonies, dendrobium orchids, anemones, ranunculus, lisianthus, germinis, astrantia, parrot tulips, stock, accented with Italian ruscus, lily grass, acacia, variegated aspidistra leaves, in a footed glass vase. Flowers and containers subject to change based on season and availability. However we will create something similar. Please call to discuss.